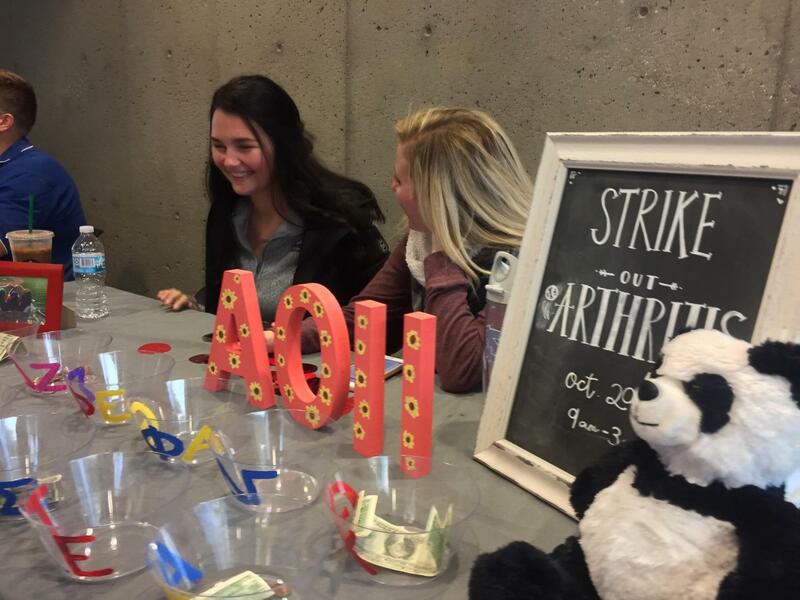 AOII tabling in the SU today for their Strike Out for Arthritis tournament. On Oct. 20, Alpha Omicron Pi will host their annual Strike Out Arthritis Wiffleball tournament to benefit the Arthritis Foundation. They are expecting a good turnout with 30 teams signed up to play between 9:00 a.m. and 4:00 p.m. According to Philanthropy Chair Shelby Wellman, the 2017 tournament raised about $3,500 for the Arthritis Foundation. Here’s hoping the 2018 tournament will build on that success. Nationally, the Alpha Omicron Pi Fraternity of women has been a supporting partner of the Arthritis Foundation since 1967. Arthritis is listed in the top ten causes of disability in the United States, with tens of millions of adults affected and hundreds of thousands of children and babies diagnosed. Dispelling the misconception that arthritis only occurs in the elderly, funds donated to the Arthritis Foundation support programs to raise awareness of childhood arthritis and rheumatism, in addition to aiding in research into the causes of arthritis, what affects it, and to develop a possible cure. According to the website, chapters and members across the U.S. and Canada donated a sum of $687,000 to the Arthritis Foundation in 2017. Wellman said NKU’s chapter of Alpha Omicron Pi is proud to support the Arthritis Foundation in their efforts to fight a disease which affects so many in North America, including some of their sisters on campus. If you want to join Alpha Omicron Pi in their campaign to Strike Out Arthritis, stop by their table in the Student Union for Penny Wars and Raffle Basket tickets, or go to the tournament Saturday to cheer on your favorite team. Tickets are only $5 and the games will be played in the Campus Recreation Center.